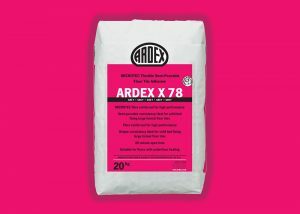 Ardex X78 from Ardex is a fibre reinforced, polymer modified floor tile adhesive, which has been formulated with Microtec Technology. When mixed with water, a smooth, creamy, pourable mortar is produced which easily enables full coverage to be achieved on the back of floor tiles, the company says. It also has double extended open time and non-lipping capabilities, making the adhesive a suitable choice for heavy, large format floor tiles. The formulation is said to greatly improve the adhesion strength, plus increase the ability of the mortar to withstand stress and shear strain, meaning increased security in the tiling system. It is suitable for use in both internal and external applications, wet areas and is especially suited to high performance situations with heavy pedestrian traffic. 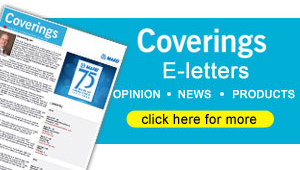 The product accommodates shrinkage movement associated with early age concrete and screeds. It can be used over concrete that is at least 7 days old and screeds after 16 hours. The adhesive is also said to reduce the chance of efflorescence due to the addition of special additives.